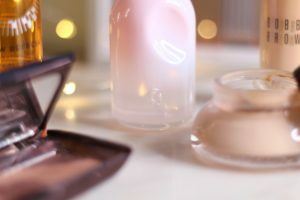 I had planned to do a round up of my favourite products of 2017 over on my Youtube channel, but since a cold decided to ruin my plans and we are already almost in February I’ve decided to do a Top 5 products of 2017 instead. Hourglass Modernist Eyeshadow Palette in Infinity, this is one of my most loved eyeshadow palettes and surprisingly never really spoke about it over here! 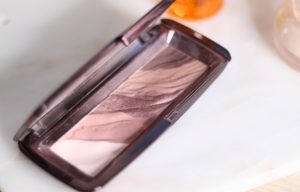 I adore these shades, for about two years now I’m all about a matte eye and this is perfect, it has a mix of warmer and cooler browns and one shimmer shade when I want to feel a little bit more sparkly! Let me know if you would like to read a review or see a youtube video where I show how I use it and my thoughts on it – there are some cons! 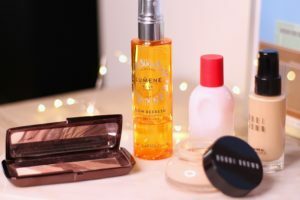 Lumene Valo Glow refresh Hydrating Mist, last year I started to explore scandinavian brands a little more and have fell in love with some of Lumene’s products. I love mists in general and this one didn’t disappoint, it is almost finished and will definitely re-purchase! It smells like oranges, hydrates and leaves my skin glowing due to the vitamin C, could I ask anything more? 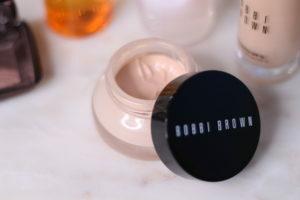 Bobbi Brown Extra SPF 25 Tinted Moisturizing balm, this as you can see has been well used! This has been my one step skincare/makeup in the mornings and it is amazing! It really moisturizes my skin and evens it out! Also wrote a review about it here! If you needed to choose five products only, which ones would say were your favourites? eu viciada em perfumes estou a morrer para saber como cheira esse e não posso ahaha! excelentes escolhas, fiquei curiosa com tudo! Achas que podes escrever sobre a Lumene? Estive na Finlândia no ano passado e conheci a marca nessa altura. Pareceu-me tudo muito bem só que nunca tinha lido sobre ela e não quis dar um tiro no pé. Se na altura soubesse disto tinha comprado algumas coisas! De resto, awesome post. Foge aos preferidos convencionais! Tudo o que experimentei até agora da lumene impressionou-me pela positiva! A feelunique tem stock de alguns produtos salvo erro!